Fogo De Chao Giveaway | A Savings WOW! Disclosure: I was invited to attend a special blogger luncheon at Fogo De Chao in Rosemont, IL. I was not compensated for this post. All opinions are my own, honest opinions. Fogo De Chao is providing the prize for this giveaway. Fogo De Chao just opened a location in Rosemont, IL and I had the opportunity to try out the food their during a special blogger luncheon on the first day they were open for lunch. One tip for you before you eat at Fogo De Chao – bring your appetite! From the salad to the varied to the delicious cuts of meat that are brought directly to your table, and ending with the scrumptious dessert, your taste buds will be very pleased and your stomach will be very full. 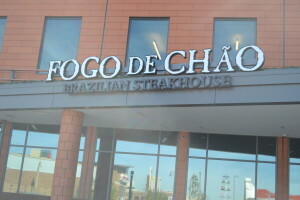 Grand Prize: A $50 Fogo De Chao Gift Certificate! To enter our giveaway, leave a comment below with why you would like to win this gift certificate to Fogo De Chao! The winner will be randomly drawn from all comments and announced live on the Chicagonista Live! show on Tuesday, October 8th at 2 PM CST. Chicagonista LIVE! will be broadcasting live from Fogo De Chao in Rosemont on Tuesday, October 8th at 2pm CST with special guests: WTTW’s Check, Please! new host Cat D’ Orio and Guy-a-titian David Grotto. Be sure to tune in and watch them to see if you are the winner of our $50 Fogo De Chao gift certificate giveaway! My husband and I will be celebrating 13 years of being together on the 12th of October and our 11 year wedding anniversary on the 25th of November. I would love to be able to do something special. Congratulations on your anniversaries! Good luck! We would love the opportunity to visit a new restaurant. Our last “fine dining” experience was a complete debacle and we need a serious do-over at a new place! It would be a perfect date night location. I’d love to take my family to Fogo De Chao! My fiancé and I love to try new places to eat and since we’ve never been (or heard of) this place, it would be a fun new adventure for us. I would like to win so I can take my beautiful wife on very nice date night! That is so sweet! Good luck! I would love to take my family to Fogo De Chao–I think my girls would get a kick out of the gauchos and maybe even try some new foods. What a great girls’ night out idea! Good luck! I would love to win this offer to help me celebrate my 32nd birthday this week. Thanks for the opportunity. Early Happy Birthday! Good luck! I’d like to win this because my husband and I love going out to eat and this place sounds tasty! This would be a great place to go out to eat and get filled – good luck! I’ve never been to a Brazilian Steakhouse and would love to win so my husband and I could go on a nice date night! What a nice date night that would be – good luck! It is my 8 year wedding anniversary this month and I’d love to go their for our anniversary dinner! Early Happy Anniversary to both of you! Good luck! I would love to take hubby for out anniversary dinner in a few months. Early Happy Anniversary! This would definitely be a fun date night. Good luck! I’d like to win so I could take my son – he’s 5, but the boy LOVES meat and can easily out-eat me when it comes to steak! If he loves meat, then Fogo De Chao definitely is the place for him! Good luck! If this is good at any location, then I’d love to win! I’d take my husband there for a surprise meat-night-out. He’d love it! We just celebrated 15 years of marriage! Seriously, how can it be that long? Congratulations on your anniversary! Good luck! Thanks for the giveaway…we love the Filet Mignon at Fogo De Chao ! I would love to win this so we can go out to a nice dinner that we can’t afford normally. My husband and I will be celebrating our 12th anniversary on the 25th of October. I would love to celebrate and surprise him with a trip to Fago De Chao!